This is the first thing I've ever posted by request. I received an email to the effect of "Hey, that autographed MK magazine you have, is it the one with the actor bios and if so could you scan it?" I replied "Nope, that's a different issue which I also have, I swear I don't collect that magazine" and I truly don't collect old issues of VideoGames magazines, these are literally the only two I own. Here's the cover. Anyone who remembers how to read old Electronics Boutique tags could a) identify the store number this was from and b) note that this is right about when they switched over to the new logo and color scheme (compare to the sticker on the magazine published four months prior). 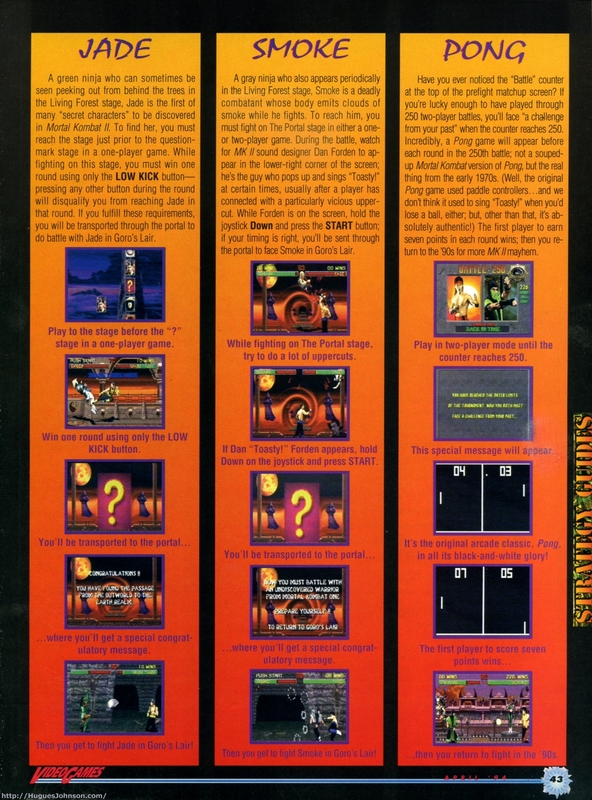 Before the bios there was a strategy guide. I figured I'd throw that in for fun. 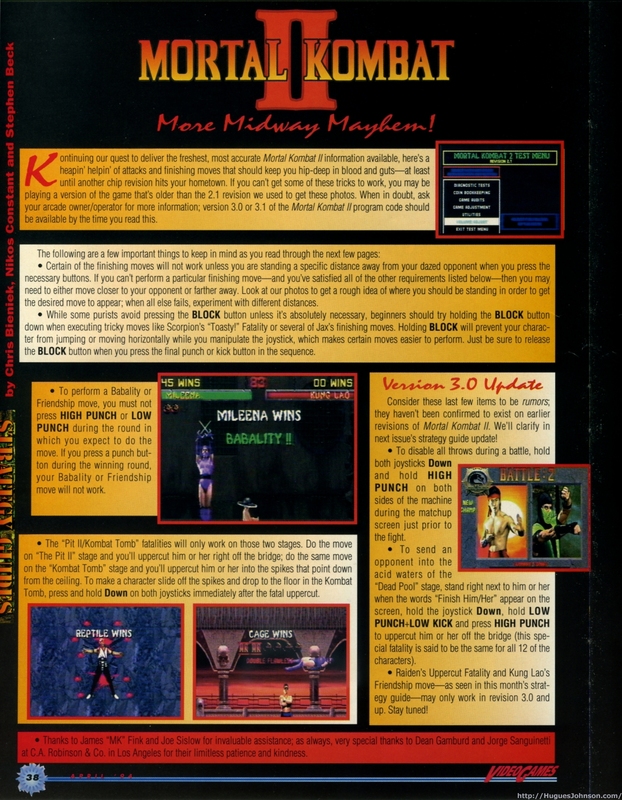 I didn't know (or maybe remember) that the "Dead Pool fatality" wasn't introduced until version 3. I think I'll offer some of my own strategy... 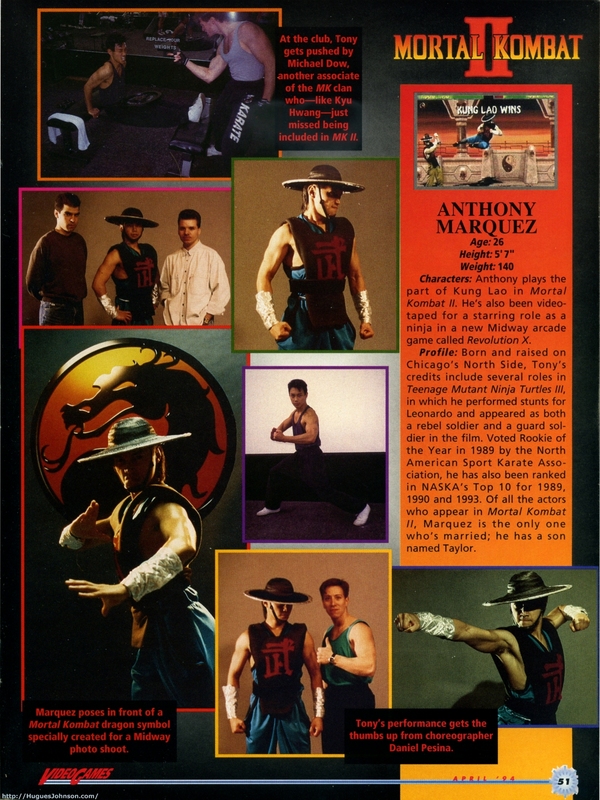 I used to regularly play against someone who had some amazing moves with Kung Lao. The only character that stood a chance was Scorpion who is a strong counter to Kung Lao. 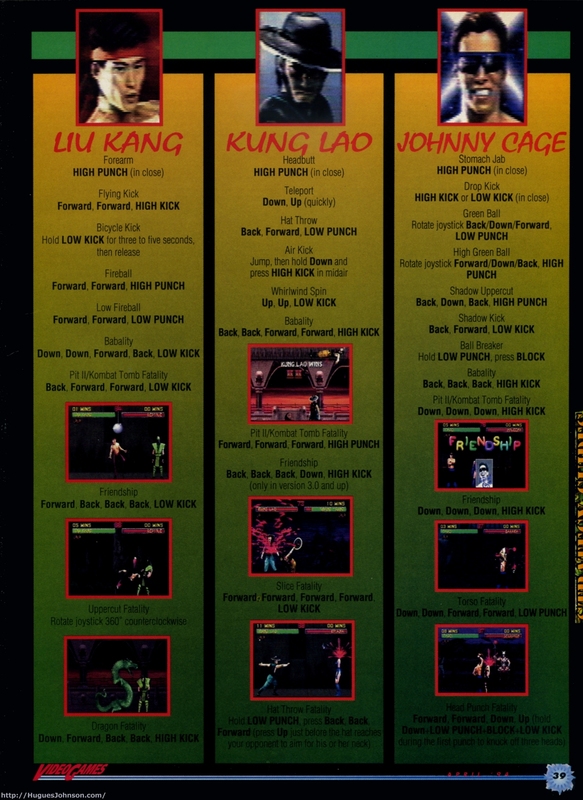 Liu Kang was a frequent choice for annoying players who liked to play keep away by throwing a steady stream of fireballs. If you ever encounter one of those, Mileena is the perfect counter. Johnny Cage, on the other hand, is terrible in 1:1 games. Shang Tsung is my personal favorite if I'm trying to play through the tournament. He's a strong choice in 1:1 matches too. Sub-Zero isn't a bad choice but is much weaker than the version in the original Mortal Kombat. Reptile was the biggest disappointment in this game. In a 1:1 match, Scorpion and Sub-Zero are both better choices than Reptile unless you are incredibly good at playing while invisible. Kitana and Mileena quickly became my favorites for 1:1 games. The best players I faced were all experts with both. Jax is another favorite of annoying players, the ones who use the ground pound as a lame keep away move. As with Liu Kang, Mileena is the best counter for these chumps. 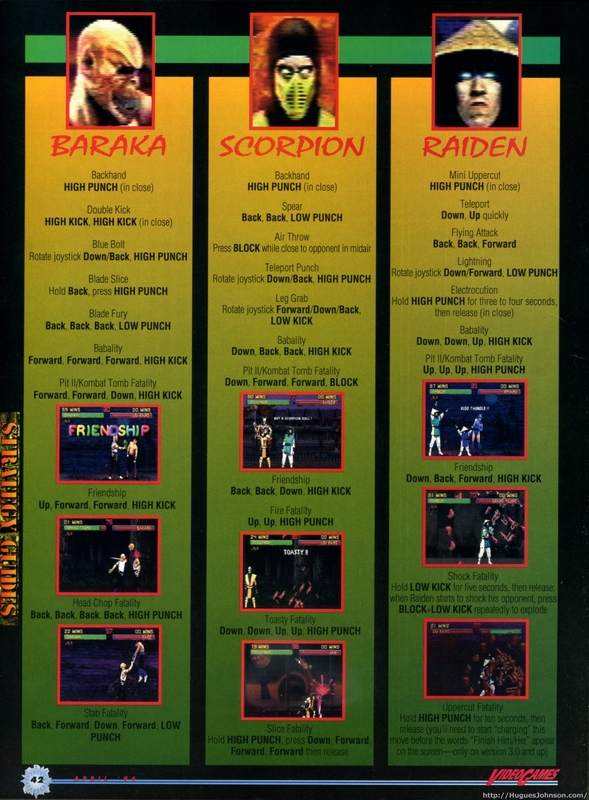 Baraka and Raiden are both weak 1:1 characters. Baraka is very popular with beginners because his moves are so easy (and gory). However, a minimally decent Liu Kang player can shred Baraka easily. I've played some who try to abuse Raiden by teleporting rapidly and flailing on the low punch button. It's super annoying but easy enough to escape with Scorpion's shadow punch or counter with Liu Kang's low fireball. Scorpion is a great 1:1 character, he's usually my go-to guy when facing someone new. He can counter a wide range of moves and has no glaring weaknesses. After learning an opponent's style I may try someone different, but he's perfect for that first match-up. 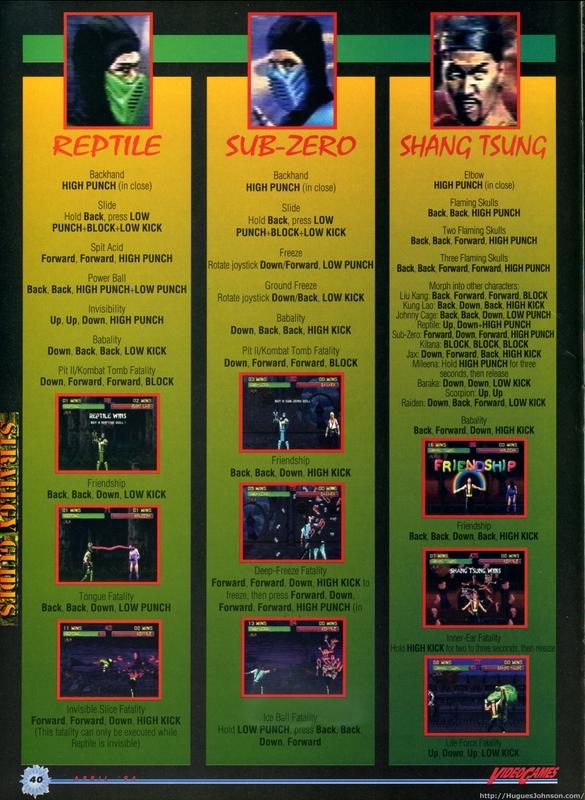 For all the hours I've logged on Mortal Kombat II, I've never played Pong... fought Jade and Smoke enough times though. 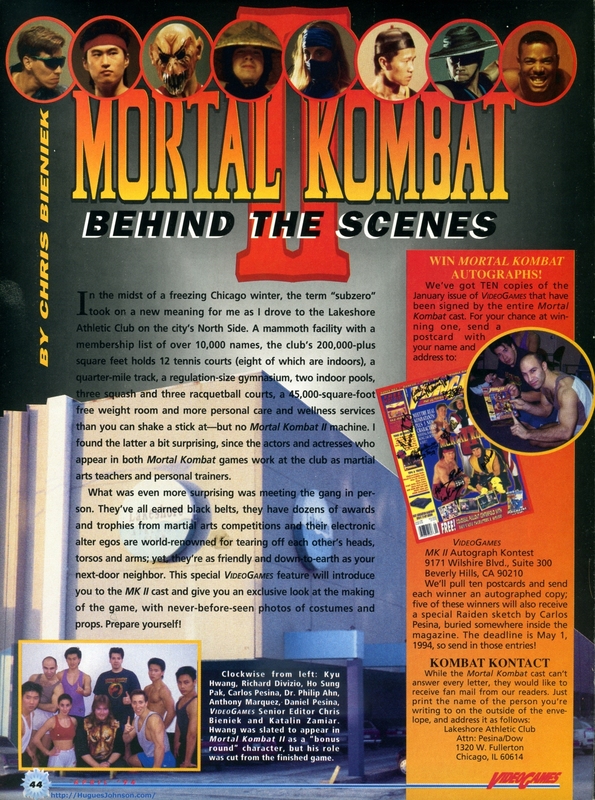 OK, so here's what you probably came for, the behind the scenes article. Hey look at that! A contest to win an autographed copy of the magazine I have (although signed by the entire cast instead of the two I have). 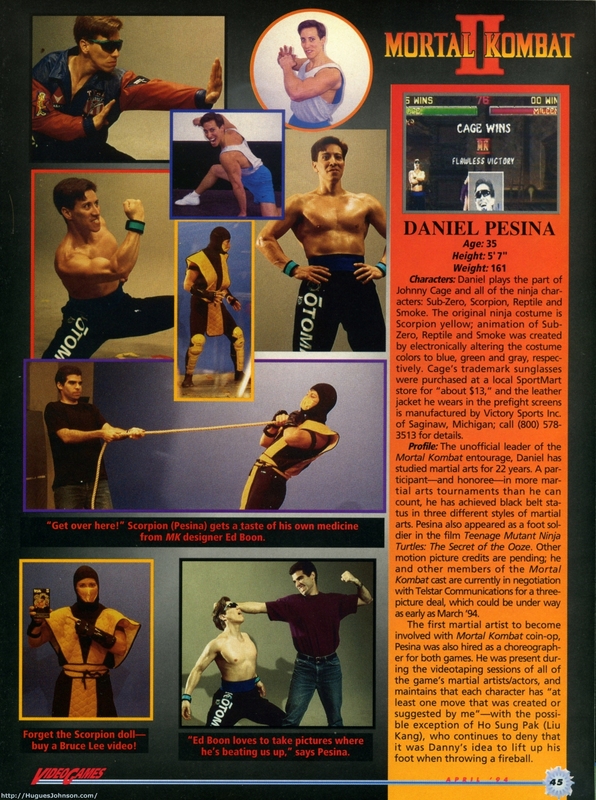 First up is Daniel Pesina who plays Cage and all the ninjas. 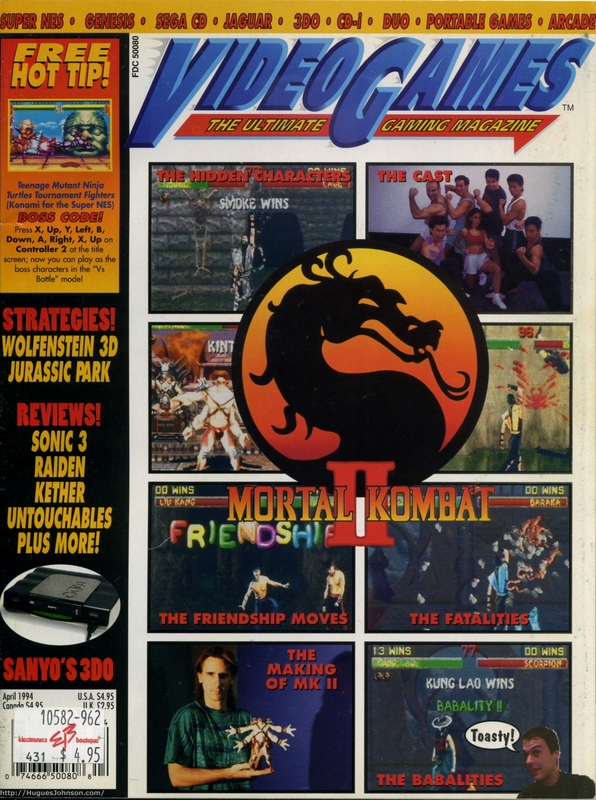 This article mentions him being in negotiations for an upcoming movie, unfortunately the producers opted not to use any of the real Mortal Kombat cast members. 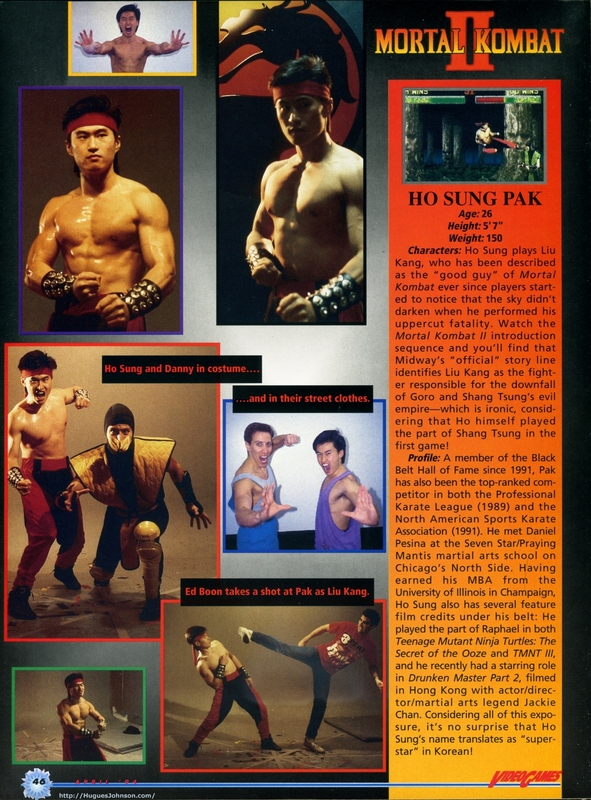 Next is Ho Sung Pak who plays Liu Kang. I'm guessing this Teenage Mutant Ninja Turtles: Secret of the Ooze movie must have been filmed in Chicago since several of the actors appear in it. Why does every movie set in Chicago have to contain the obligatory shot of the "L" in the background? No matter how forced, they always manage to have a scene involving it. 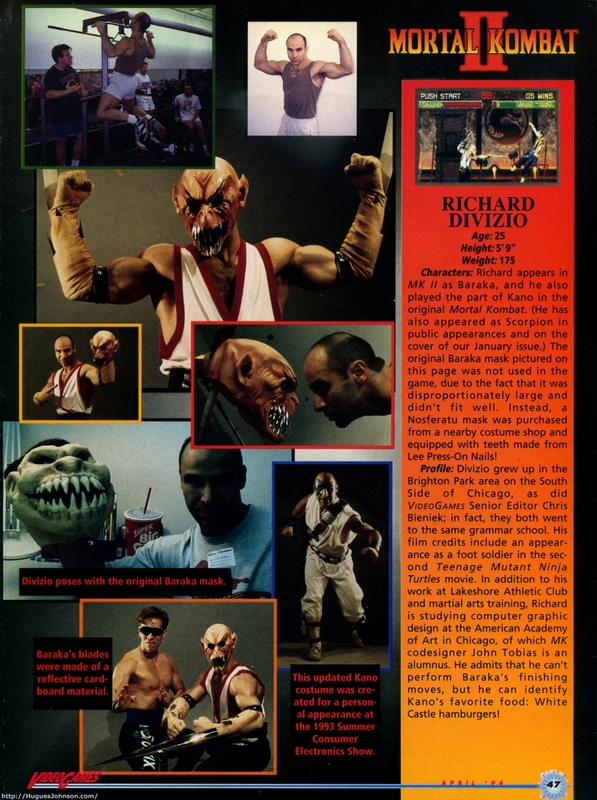 On to Richard Divisio.. that original Baraka mask looks like Shrek to me. 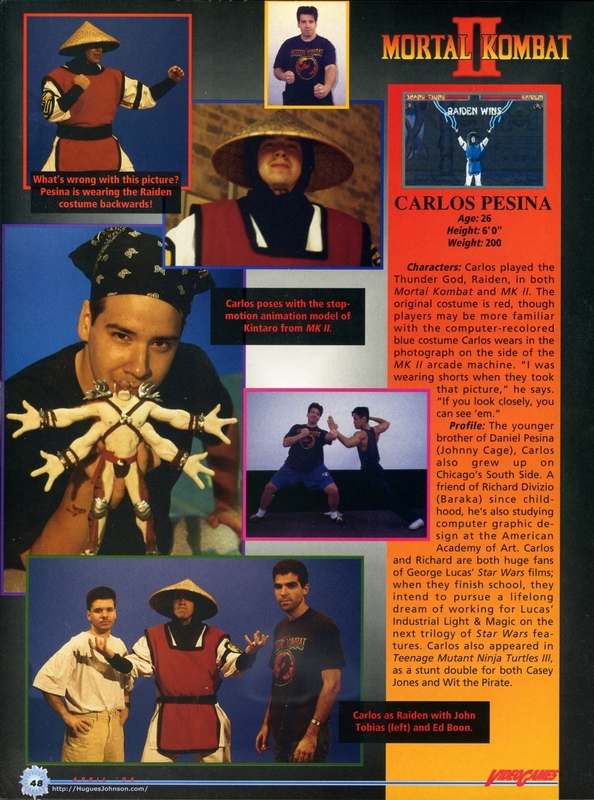 Carlos Pesina is the next page. That Kintaro model is awesome, that would be a dream item for my collection. ...just like Philip Ahn M.D. did. According to a quick search he is practicing medicine in Chicago or possibly L.A. today. Turns out his name is more common than I expected. Either he can grow facial hair at will or the goatee is fake. The bio for Anthony Marquez is a little on the light side. 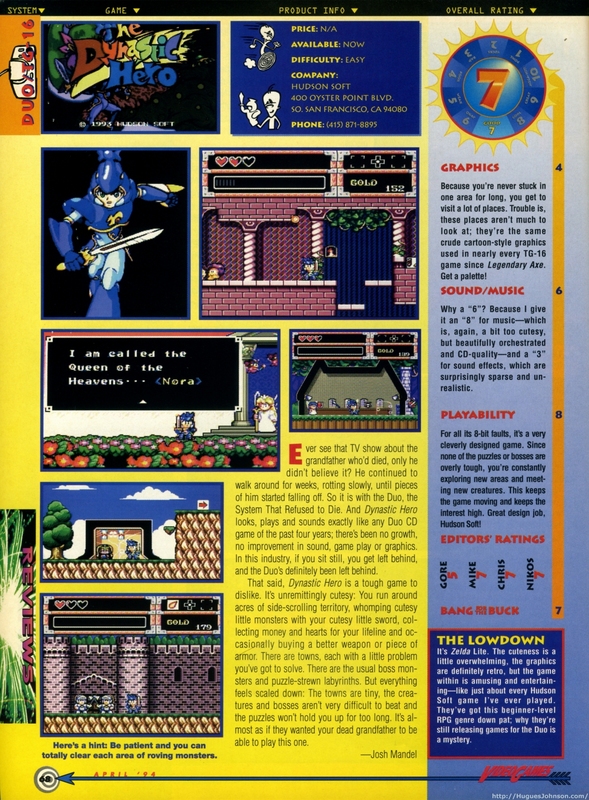 The interesting thing on this page is the reference to another character that was cut from the game. Much like Dr. Ahn's goatee, I suspect some of these screenshots are fake too. 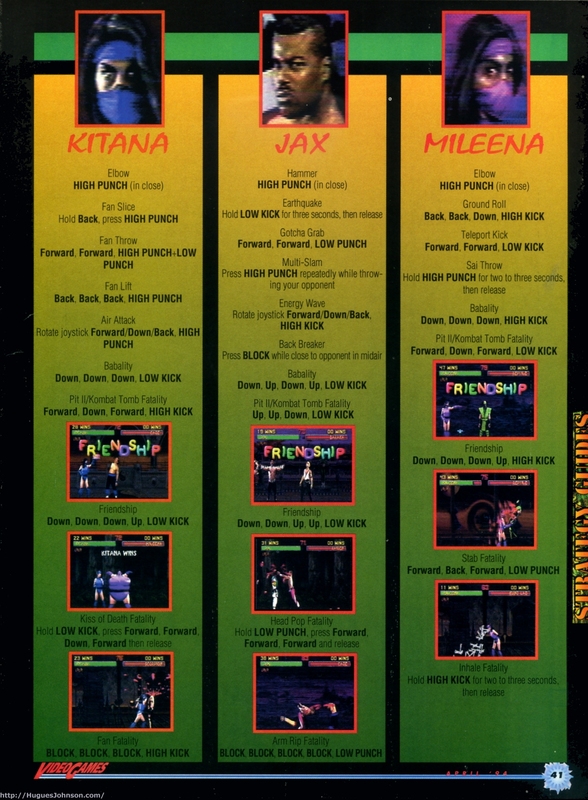 Check out the "Kung Lao Wins" one on this page. The original Jax costume they had John Parrish in was truly atrocious. It looks like a banana suit. They must have the height stats wrong in here. They talk about needing to digitally shorten Jax but they have him listed as only 2" taller than Daniel Pesina. Seeing them next to each other I think that's off by a bit. Since I was already scanning the magazine, I thought I'd add a few extras I found interesting. Here's a blurb about the Sanyo 3DO which was only released in Japan. Here's a review of Dynastic Hero. I only added it so I could rant about not wasting money on buying the Wii Virtual Console version. Don't get me wrong, I am thrilled they're releasing TG-16 CD games that were only available in Japan for it. I bought Dynastic Hero as some kind of show of support. However, it is not as good as the Genesis version that is also available. I guess the soundtrack is a little better but the Genesis one has much better graphics and a more reasonable difficulty level. Meanwhile, Ys IV is collecting virtual dust. I included this because I'm a huge Phantasy Star fan. 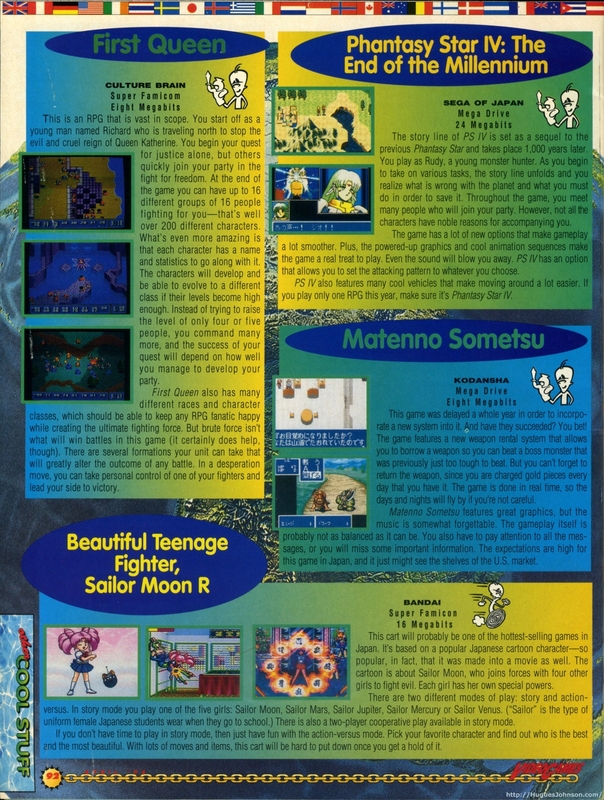 It's a page previewing some Japanese RPGs that might make it to America. The battle scene from Matenno Sometsu reminds me of Miracle Warriors. First Queen looked like a good game until I saw it was produced by Culture Brain.